On one of my many beauty shopping trips I decided to try out a new face scrub as the one I had been using ran out. I wear BB creams and general makeup everyday so I am always looking for a gentle face scrub that would serve as a pre-cleanse. I don't like using makeup wipes to clean off my makeup at the end of the day as I feel it is a waste. I prefer to wash my face twice with facial cleansers and water for a squeaky clean face. Most BB creams and foundations plus heavy eye makeup are pretty hard to remove. Hence I like to wash my face thoroughly. 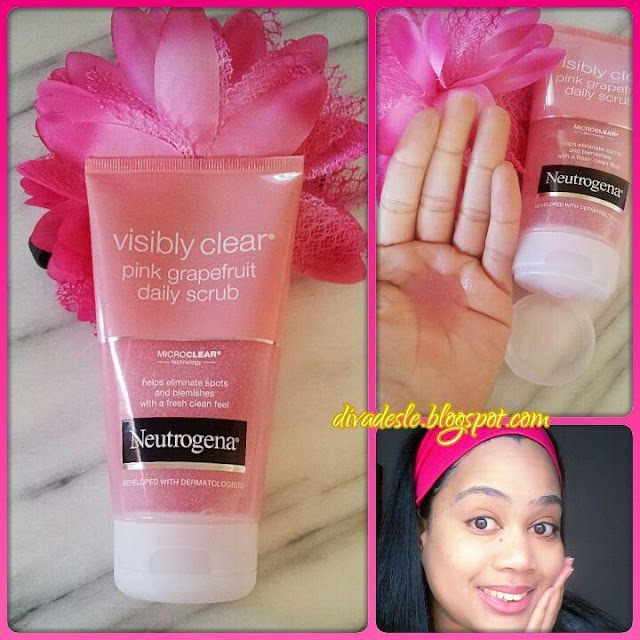 I decided to try the Neutrogena Pink Grapefruit scrub as I have never used this range before and the price looked good. There are a lot of mixed reviews regarding this product online. Some seem to absolutely hate it while others adore the product. I thought I would give my 2 cents worth on it too. No makeup! Just me, my puffy eyes and my craziness!!! The product is described on the tube as a daily scrub that eliminates spots and blemishes while leaving your skin feeling fresh and clean. The scrub comes in a pretty pink 150ml tube and it smells like sweet grapefruit. The consistency of the scrub is a gel like texture with fine micro beads, The beads are really fine and you have to look closely to see them. The scrub is gentle on the skin but you still feel like your skin is being exfoliated thanks to the fine micro beads. I gently rub the scrub all over my face in circular motions and wash it off with water. The product lathers well and a little goes a long way. It does a great job in removing most of my makeup and my skin feels fresh and uplifted after using this. I then go in with my Clarins gel facial cleanser and wash the rest of my face again. I actually like the grapefruit scent and it does a great job in energising your senses and making you feel awake if you use it in the morning. Despite its claims of eliminating blemishes and blackheads, this is not a miracle scrub. I think it is a good scrub for daily use giving you a squeaky clean face. I don't think it will eradicate your skin problems any time soon. If you have sensitive skin then I suggest you stay clear of this scrub and try something that's less harsh as the micro beads or the alcohol in the product might irritate your skin. I hardly have issues with skin care products. My skin rarely has a breakout or flare up when it comes to skin care.I have not experienced any problems with this scrub. Maybe it's due to the fact that I use it as a pre-cleanse and wash my face afterwards with my Clarins gel. Either way, the scrub does its job in removing my makeup and cleansing my face. I think with most skin care products as this one, you have to test it out for yourself to see if your skin agrees with it or not. It sounds really refreshing. I can't use it, but my mom may like this. I really want to try it too, but we don't have it here! I use a Garnier one that smells of oranges instead!